Undefeated UFC lightweight champion Khabib Nurmagomedov swiftly exited the octagon after submitting mixed martial arts megastar Conor McGregor at UFC 229. The reigning champion then attacked McGregor’s teammate Dillon Danis. A brawl quickly broke out between the two fight camps, all taking place during the live UFC record breaking pay-per-view broadcast. The UFC would go on to ban Nurmagomedov’s teammate Zubaira Tukhugov from the promotion for having allegedly attacked Conor McGregor during the brawl. The Nevada State Athletic Commission (NSAC) have since frozen Khabib Nurmagomedov’s $2 million payday while they proceed with an investigation into the matter. Khabib Nurmagomedov has since demanded that the UFC reinstate his teammate under the threat of leaving the UFC himself if his terms are not met. Meanwhile, hip-hop icon 50 Cent appears to have been keeping a close eye on the situation. 50 Cent recently landed a partnership deal with Bellator MMA and has since been putting the relationship to use. 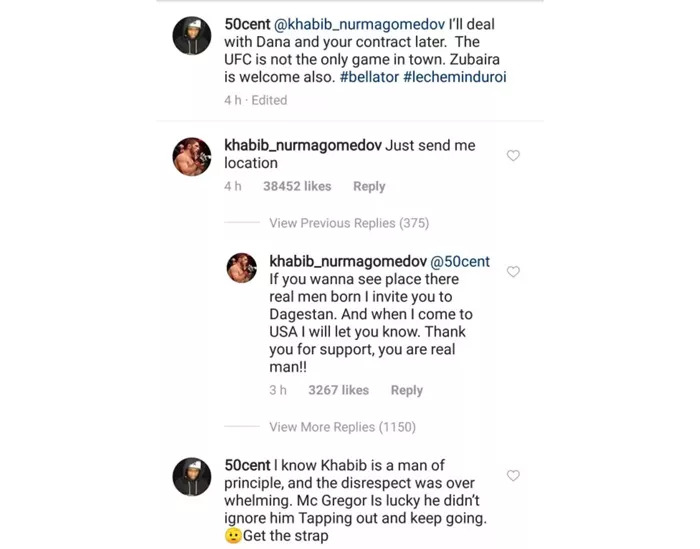 Taking to social media, 50 Cent has come forward to offer Khabib Nurmagomedov the full $2 million payday the Dagestan native is waiting for if he moves to Bellator MMA. As reported by MMA Mania, it would appear that Khabib Nurmagomedov has now offered a response to the message. Check it out below.